There’s an old saying that warns against giving someone an inch, lest they take a mile. I suppose you could say that’s true about Full Moon founder and cult horror director Charles Band. Audiences gave him an inch by responding well to his minor horror hit, Puppet Master, and he took one hell of a mile by milking the title into a franchise that's now eleven films films long with the release of Puppet Master X: Axis Rising. Sure, everyone knows that guys like Freddy, Michael, and Jason just won’t die until box office receipts condemn them to their fates, but who would have thought that Toulon’s Puppets would have hung right there with them? I certainly would have never guessed it, even though the films were littering my local stores throughout the 90s. Ten years later, the demented little bastards are still going strong, and I figure the release of a new film is just a good as time as any to revisit some old, diminutive friends. One thing I came to re-appreciate from the series was its attempt to develop some sort of story arc and mythology (with continuity being optional); the results weren’t always good, but it was a pretty fun ride at times--and hey, at least we never got Puppet Master: In Space, though I'm sure we're only a few entries away from that. I’m not sure whose idea it was to create Puppet Master: The Clip Show, but something tells me that even the minds behind Silent Night, Deadly Night 2 would find their cow-milking efforts here to be quite egregious. The run-time for The Legacy is about 75 minutes long, and I reckon about 65 of those minutes are used to completely re-cap the series thus far. There’s a frame story in there about some rogue female agent trying to coax Toulon’s secrets out of one of his associates, but it isn’t exactly riveting stuff. In other words, you can hardly call this entry a movie; instead, it’s just a poorly-conceived nostalgia trip that adds nothing of value, unless you really want to know what happened to the kid from part 3 and the nerd from parts 4 and 5. Oh, there’s also a nice note from the producers thanking everyone for making the series such a success over the years. I think they should have been issuing an apology to anyone who wasted money on the movie instead. You’d think that someone would have to try really damn hard to be worse than The Legacy, but this sixth entry actually isn’t too much better. 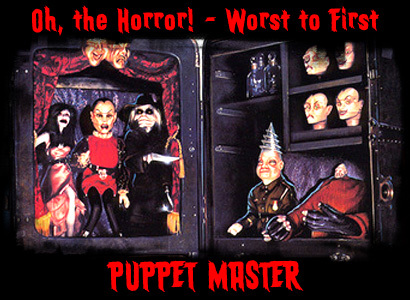 After the more fantastical fourth and fifth entries, Curse of the Puppet Master attempted to take the series back to its roots. This time, the puppets end up in a doll museum, which is obviously a more natural setting for them. The problem is, they just don’t do much. With the exception of a few sequences, they’re just content to hang out in the background and let the characters take center stage. This wouldn’t be such a bad thing if said characters were interesting at all; instead, following the misadventures of the doll museum owner’s daughter and her dopey boyfriend is tedious. There’s sort of an interesting story in there about the owner attempting to turn said boyfriend into a puppet himself, but, like everything else that’s interesting in the film, it all goes down during the last five minutes. It’s also a rip-off of the film Sssssss, which is really the least of this entry’s problems considering the other 70 minutes of the movie left me contemplating why anyone would really miss the guy in the first place. After the more than lackluster Curse, the franchise attempted to get back on track by getting back to its roots. In fact, it went way, way back, all the way to Cairo in 1902 to tell us the story of how a young Toulon learned his secrets. The results are less than stellar, but it at least rounds out the story and completes it in a sense. The Retro-styled incarnations of the puppets are pretty neat, but the PG-13 rating really limits the amount of slashing they can do. There’s also plenty of bad accents and amateur acting to go around, but I suppose that’s to be expected from the 7th entry in a direct-to-video series about killer puppets. At least the demon Sutekh only bothers to lend his voice to the proceedings, but I have a feeling the film’s budget just didn’t allow the crew to re-create his already cheap-looking visual presence (see below). The most recent entry manages to just scrape past Curse and Retro, but just barely. While it exhibits many of the same problems as that film (an uninteresting storyline with uninteresting characters, too little puppet action), it’s put together just a little bit better. Plus, even though the acting is pretty dreadful, it still manages to be a bit better and believable for the most part. This most recent outing also promises some good news and some bad news: it sets us up for yet another film (somehow, that’s the good news), but it will seemingly be a direct follow-up to this storyline (crap). As a general rule of thumb, you should really just avoid all the films on the list so far unless you're a diehard fan of the series or have a fetish for killer dolls. Finally, we've made it into "watchable" territory. Okay, so the puppets never went to space. However, that didn’t stop the series from going a bit out there with the forth and fifth entries. Even though part III sort of put the puppets in the role of anti-hero, part 4 is the one that completed the turn. Boasting the tag line “When Bad Puppets Turn Good,” the film sees Toulon’s bunch do just that when an underworld demon, Sutekh, sends forth a few minions to retrieve the deceased puppet master’s secrets. Unfortunately, the puppets just aren’t as interesting when they’re battling claymation demons and playing laser tag with an MIT nerd. It’s fun to kind of root for them, and they really begin to come into their own as far as developing personalities, but the more fantasy-tinged tonal shift is just a bit odd. Plus, at the end of the day, you kind of wish the puppets were still using their talents on idiots and scantily-clad women. One highlight of the film is the introduction of Decapitron, which is apparently the Swiss-army knife of enchanted puppets and can handle all of your demon-slaying needs. Part five is one entry in the series that really adds nothing new; in fact, it’s pretty much the forth film all over again because that pesky Sutekh is still after Toulon’s secrets. It’s really not much better than part four, but the series enters into some real mozzarella territory here. It’s an undeniably silly film--just watch as it takes Sutekh 40 minutes and about a 100 pelvic thrusts to create his newest demonic creation. Furthermore, just about every character is a bonafide idiot or clumsy to an extreme, as everyone who attempts to escape the claymation demon inexplicably falls down. By this point, the series was beginning to show its low budget, and the ambitious fantasy elements didn’t help matters. It even seems like they ran out of ideas and just copied the climax of part 4, as Decapitron is invoked again to settle the inter-dimensional scuffle. I’m not going to lie, part 4 and 5 are pretty much interchangeable. The tie-breaker? Clu Gulager, who shows up for about two minutes, yet still manages to call a dude “buddy-boy.” Bless him. I’m a sucker for crossovers, even when they involve a throwdown between killer puppets and toys from a couple of Z-grade direct to video franchises. Throw in a heaping helping of Feldog, Vanessa Angel, and a Christmas setting, and this one is a virtual can't-miss for me. I’m not going to try to convince you that the film is good (it’s far from it), but it’s nuttier than a fruitcake. It’s hard not to find some enjoyment in a film where Feldog has to thwart a Halloween III-inspired plot (Angel is a demon-worshipping toy maker whose line of popular toys will come alive and kill children on Christmas morning). The titular smackdown is actually disappointingly brief, but the movie at least provides the novelty of seeing the two sides duke it out for the title of Full Moon toybox champion of the world. Actually, Full Moon and Charles Band had nothing to do with this one, yet it somehow manages to be among the most entertaining in the series…not that that’s saying a whole lot. The title for part III seems to promise retribution for Toulon’s fate in the second film, but not so fast. Instead, we’re transported back to war-torn Nazi Germany in 1941, where we find out exactly why Toulon is on the run in the first film. It turns out Toulon’s ability to bring his puppets to life is wanted by the German state. He’ll have none of it, so his diminutive associates become a back of inglorious, Nazi-killing bastards. When I was younger, this one didn’t get a lot of play, probably because the period setting didn’t do much for me. Sure, it managed to throw in all the slasher tropes (even Nazi Germany had plenty of whores willing to show some skin), but the action aspect and political intrigue didn’t do much for me. It’s aged well, though, and now I see the film as essential in expanding the mythology of the series because it especially makes the second film resonate so much more. Seeing Toulon as a more tragic anti-hero sets casts a bit of a different light on his character; the reference to Faust (which is actually first seen in the second film) is spot on and highlights the tragic qualities of the character. The puppets themselves are also great here, and it’s fun to see the origins of Leech Woman and Blade. The one that started it all, Puppet Master is a solid foundation. The premise is wacky enough: group of psychics all gather at an old hotel where Toulon hid the puppets. Of course, the puppets find them first, and the results are bloody. Even though the original is a bit slow at times, it’s still a pretty well done little slasher (once the slashing begins). The colorful cast of characters adequately complement the puppets, as they find themselves in some memorable situations (BSDM escapades go a little bit further hen Tunneler and Leech Woman are involved!). The Bodega Bay hotel setting is effective as well, and there’s enough twists and turns in the plot to keep things interesting; in fact, the film starts with a literal bang when Toulon blows his brains out to the dismay of two Nazi spies. It’s also sort of odd start because the old man is pretty much irrelevant to the proceedings; in fact, it’s the creepy Neil Gallagher (played by Jimmie Skaggs) who ends up being the titular character in this one. Leaner and meaner than its predecessor, Puppet Master II is everything a good sequel should be. It expands on the premise and setting of the original (just substitute psychics for a team of paranormal investigators), and features more puppet action (brought to life by effects that even outdo the original). As a result, it’s an even better slasher than the first one, as the puppet gang tears up everything in its path (including George “Buck” Flower) in order to serve their new master…the recently resurrected Toulon! The original puppet master is back and finally gets involved with the main plot; Steve Welles is great in the role, and his Invisible Man-inspired get-up is effective and mysterious. Lest you think this one is all about the slashing, think again--the first sequel begins the process of delving into the mythology of the films, as we begin to understand just what makes Toulon tick. The end result is a great balance of slasher fun and nice storytelling, as Toulon’s story is one of tragic, lost love and madness, and it makes for the best Puppet Master film so far.